To come to the end of one's life and be full of regret is a terrible thing for anyone to experience. The whole idea of living with no excuses and loving with zero regrets, right out the window. A life full of missed opportunities and wasted possibilities. What would you do if faced with such a situation? In his novel Doctor Hydenberg, author Jeffery Martin Botzenhart presents just such a scenario. However, there is much more to this than meets the "eye". For lovers of fictional horror which is peppered with a romantic twist, this selection is a wonderful choice! Essentially, the story follows the escapades of Doctor Benjamin Hydenberg and Heathcliff Gray. Heathcliff is the abandoned son of Benjamin's best friend Peter. As he is near death (with thanks to his wicked wife and her mistress) Peter reveals that he has a son whom he abandoned many years ago. He is consumed with regret by this and wants to make things right before he dies. Being a man of considerable wealth, he wishes to bequeath his fortune solely to his long lost son. Not only that, but he also wants to pass along his actual life experiences to Heathcliff. But how can he possibly accomplish such a seemingly impossible feat? Enter Doctor Hydenberg. He believes that the eyes actually hold human memories and if they are properly harvested and transplanted those memories will be transferred as well. This is a theory which is put to the test with Peter and Heathcliff. However, there is a terrifying danger lurking around every corner in the from of Peter's wife and her mistress Genevieve. She is a high priestess of the occult and an adept mind reader. Together with Angelique they are determined to thwart Peter's plans and inflict their own terrifying brand of horror. Will Heathcliff actually be able to enjoy the peaceful life his father wishes for him? Maybe even discovering love with a new romantic interest in the process. Or is horror about to descend like a cloud in a relentless and terrifying manner? For a story which is rather short in length, there is an awful lot to enjoy in this tale. We are able to explore the elements of horror, but these are cleverly intertwined with aspects of love and romance. The theme is quite clearly a good versus evil one. The author very capably utilizes suspense and fear which are juxtaposed with the romantic notions of love. There is an ongoing sense of tension and conflict which is trying to keep the potential lovers apart. For instance, the relationship between Peter and his wife embodies the horrific elements of the story, while Heathcliff and Kristina symbolize hope in the form of a budding romance. Overall I found the plot to be thoroughly engaging and full of suspense. It will certainly keep the reader glued to the pages! Nevertheless, there were a few sections which I was left a little dubious about. For example, after Benjamin removes Peter's eyes, there is no mention of this by the investigating officers. A suspicious death would lead to such a discovery very quickly and would not be hidden by the corpse having their eyes closed. However, other than the law enforcement angle I think the story was quite believable and enjoyable. The novel also contains a number of very interesting and well developed characters. The various perspectives, emotions and motivations of the characters are presented in an intriguing and engrossing manner. Also, the mind reading abilities of both Heathcliff and Genevieve provide even further insight into these characters and those around them. They are actually the epitome of good versus evil respectively, and work to support the theme exceptionally well. While the character of Benjamin is also developed in depth, he actually seems to be more of a raconteur so to speak. Nevertheless, he is an essential part of the novel as he essentially helps guide the events. I thoroughly enjoyed Doctor Hydenberg. The writing flows beautifully and aside from a few minor plot holes it is an exceptionally good read. It also has a very gothic feel to it which in turn matches all the main story events. I look forward to reading more of this author's work and would recommend this particular book to all adult readers. There are a few horrific and graphic scenes so if you are not into that be forewarned. 4 out of 5 Macabre Stars for this one! 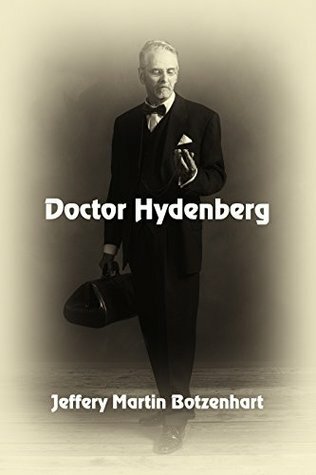 Sign into Goodreads to see if any of your friends have read Doctor Hydenberg.